The Sixth First Climate Refugees | Watts Up With That? For years now, folks have searched desperately for the “fingerprints” of human climate change. These are things that are supposed to reveal how and where humans are affecting the climate. One of these fingerprints, which is alleged to be a sure and certain harbinger of the thermal end times, is the appearance of the long-awaited “First Climate Refugees”. The UN IPCC confidently forecast that there would be 50 million climate refugees by 2010 … we saw none. But before that there were supposed to be climate refugees from the coral atolls of Tuvalu … which turned out not to be sinking but instead expanding in area. So I guess they were the First Climate Refugees, and since it turned out there weren’t any climate refugees from Tuvalu, that makes the missing 50 million the Second First Climate Refugees. Then the Third First Climate refugees were supposed to be in Bangladesh, but that turned out to be a recent squatter settlement on one of the many silt islands that appear and disappear in the river mouth there, once more nothing to do with climate. In each case, of course, the people involved were widely touted as “the First Climate Refugees”, and like the first robins of spring, were predicted to be the first of many such occurrences … but they were never the first, because no refugees actually appeared. Plus there have been some more, I think the folks from Shishmaref Village in Alaska were something like the Fifth First Climate Refugees. As a result, when a friend of mine said he was concerned about reports of a village in Alaska which was going to be lost and the people become refugees, I figured it was the old favorite in that regard, Shishmaref Village. But it turned out that he was talking about the latest poster child, the Sixth First Climate Refugees, a village called Newtok in Alaska. And I’ll get to Newtok, but first, I went back to see I could find out about Shishmaref, and it’s hilarious. Shishmaref was said to be eroding away because of CO2 leading to less ice, leaving open water for storms, which erodes the foreshore … Figure 1 shows the damage we’re talking about. Erosion at Shishmaref is somewhat unique along the islands because of its fetch exposure and high tidal prism, relatively intense infrastructure development during the 20th century, and because of multiple shoreline defense structures emplaced since the 1970s. Erosion rates along the island front exceed (and are not comparable with) those along adjacent sectors. 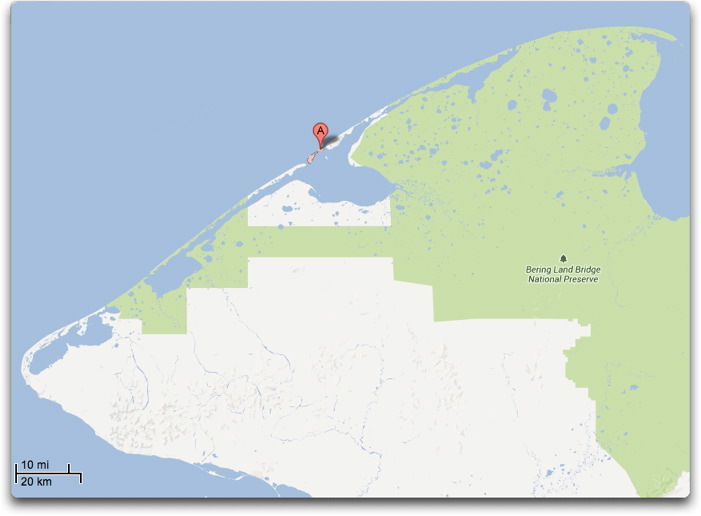 Erosion is occurring along the entire island chain, but it is exacerbated at Sarichef Island [where Shishmaref is located] in part because of the hydrographic impacts of hard armoring of a sandy shoreface and permafrost degradation that is accelerated by infrastructure. So it turns out that the erosion is not from global climate change, or global anything. If it were it would affect the other islands. Instead, the problem stems from previous efforts to protect the foreshore that had unintended consequences. What they did was to “hard armor”, which means lay a solid layer of rocks on, a sandy shore. These early well-meaning attempts to affect the coast often had unintended consequences. What was not appreciated back then is that a sandy beach, like the ones that they hard-armored, naturally evolves to take the form that dissipates the maximum energy of the waves. The shape of the beach changes to absorb and dissipate the energy in several forms. One is to have the water roll up and down the beach in as thin a sheet as possible given the physical constraints. This maximizes turbulence and thus energy loss. Another is the picking up and dropping of tons and tons of sand per hour. When each wave breaks, the top layer of sand is picked up and mixed throughout the turbulent white water. This constant lifting of tonnes of material helps absorb the wave energy. But when you “hard armor” such a beach, you lose much of that. The village is being preferentially eroded because they hard armored a section of sandy shoreline. As usual with this kind of amateur meddling, you rarely get what you expect. In this case what happens is that energy that previously was absorbed by waves breaking on the sand is simply redirected elsewhere along the coast … which changes the direction and strength of the currents, and surprise, surprise, the seafront along town starts eroding. Because if the wave energy is not absorbed, it has to go somewhere. So it goes into pushing the water along the beach. And this, obviously, can cause problems down the coast. So once again humans are indeed the cause … but it has nothing to do with CO2. To make it worse, understandably when Shishmaref village was built (around 400 years ago), these folks weren’t concerned about melting the permafrost when they built their traditional homes. Modern practice if you are concerned about preserving permafrost is to build up off of the ground. But traditional houses in the north are built on or even in the ground, because it’s much warmer not to have wind whistling under your house. And for hundreds of years this wasn’t a problem. At present, however, they are living in modern buildings of fairly recent vintage, not their traditional structures. Plus the population increase, with lots of new buildings. Plus clearing land for roads, which exposes it to the sun. Plus increases in house heating … and at the end of all of that, as a result of thousands and thousands of days of more and more fires warming more and more houses, the permafrost is diminished, and the erosion is increased. But but to blame CO2 as the culprit for that, as was shouted from the rooftops by Greenpeace and the Sierra Club? Sorry. If that were the case the whole coastline would be eroding. It isn’t. We know why the village shore is eroding, and it’s local actions, not global actions, that are the culprit.. Figure 2. The amazing expanse of the Yukon-Kuskokwim delta. Originally, everything inside of the red line was once ocean. At that time the two rivers flowed into a bay, but over the millennia, silt has been deposited over a huge area. 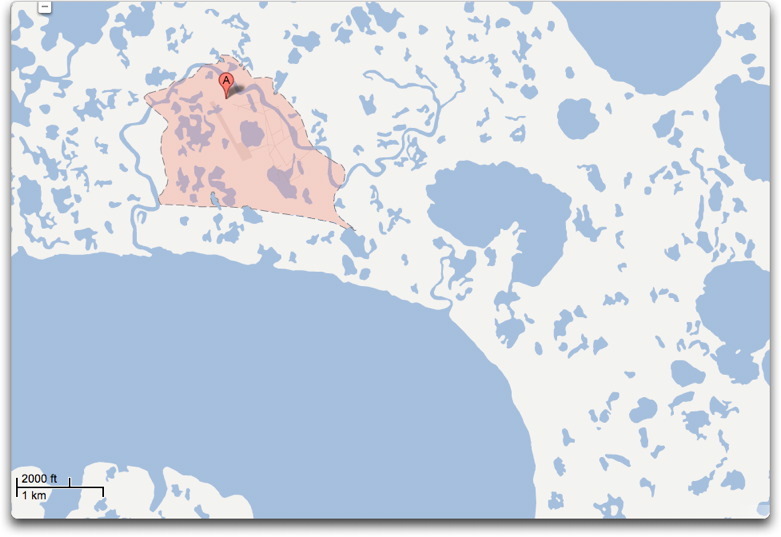 The village of Newtok is indicated by the red “A” marker, just off of the river that drains the large lake. Figure 3. 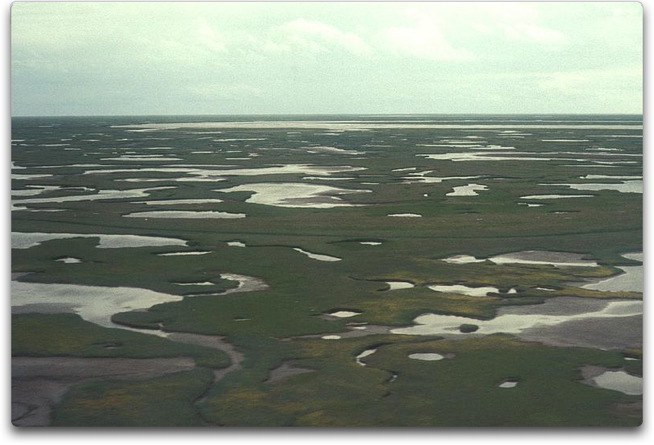 Kuskokwim delta wetlands. Miles and miles of silt. Figure 4. Newtok Village, Alaska. Figure 5. 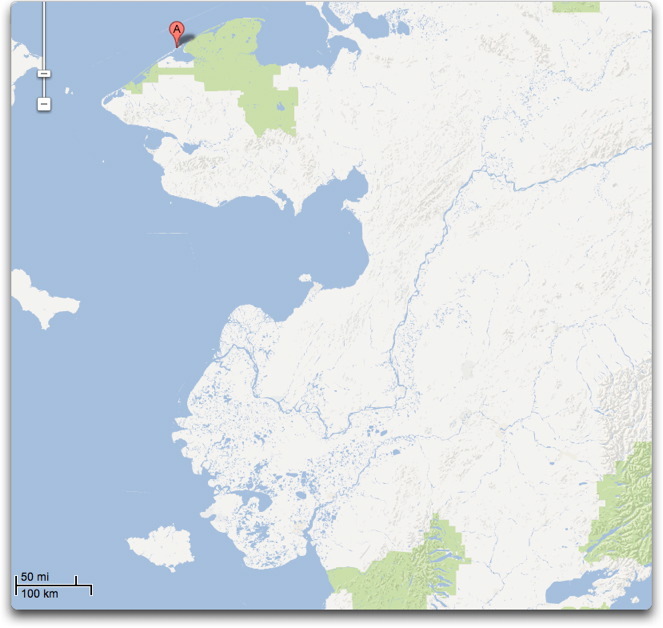 Location of the village of Newtok, as seen on Google Maps. This is the map layer. Land is white, water is blue. Newtok Airstrip is just south of the “A” marker. Figure 6. Exact same view in Google Maps, but showing the satellite layer. Note the change in the main channel. Just like every other meandering channel on the planet, it has eaten away on the outside of the bend. That’s what rivers do. They eat away at the outside of bends, and the silt is deposited on the inside of the bend. It’s totally predictable. Compare the inside of the bend with Figure 5. See how it has built out? So let me recap the bidding. 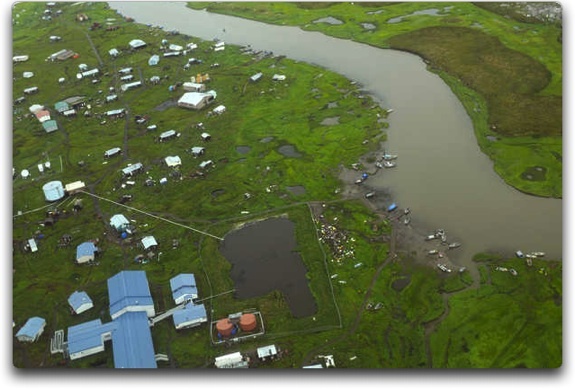 The village of Newtok is built on top of a couple of feet of silt, in a relict channel towards the seaward side of the Yukon-Kuskokwim Delta. It is surrounded by cutoff oxbow lakes testifying to the constantly meandering, shifting nature common to all river deltas. Like all river deltas, we can assume that the ground is subsiding, it’s what they all do. And in such conditions, both erosion and deposition are constant processes. At any time, any given location is either gaining or losing soil. Not only that, but the village is built on the outside of a bend in the main channel, a location which can be confidently predicted to be eroded away sooner or later simply because that’s the unchanging ancient nature of river deltas. … and they claim this erosion is a total surprise, and that CO2 is to blame? It’s a village built on a thin layer of geologically recent and only lightly consolidated silt. The silt is slowly compacting and sinking. And to top it off, it’s on the outside of a bend in an active channel near the outer (newer) edge of a huge river delta. It’s a couple feet of freshly created land in a location we know will erode, what the heck do they expect? Long-term stasis? Now, I said I’d finish the Shishmaref story. Here’s the funny part that I hadn’t understood. I’ve seen lots of small rocky islands when commercial fishing in the Bering Sea, some not all that far from Newtok actually. So that’s how I imagined Shishmaref. But to my surprise, it’s not like that at all. Here’s the large-coverage map. Figure 7. 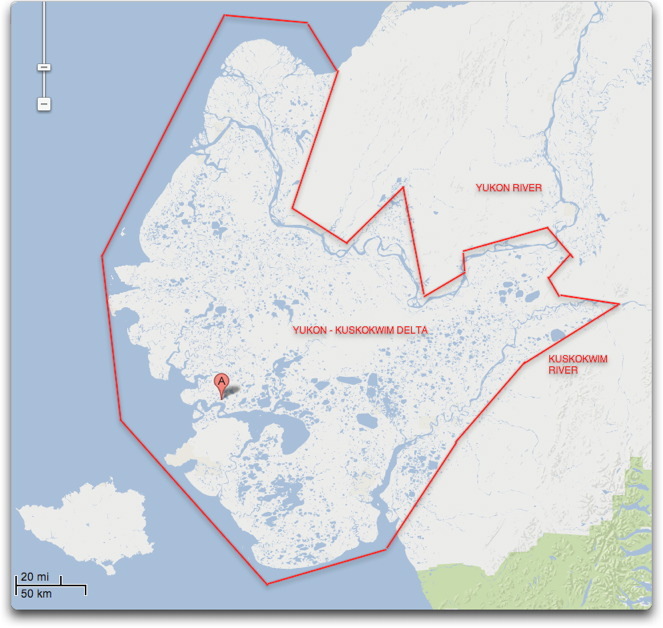 Map showing the area from Newtok Village (in the Yukon-Kuskokwim Delta, bottom center) to Shishmaref Village. Russia is on the top left, and Shishmaref (“A” marker) faces the Arctic Ocean. Next, here’s a closer view. Figure 8. A view of the entire peninsula. Shishmaref is one of a chain of islands along the coast. When I saw that map, my jaw dropped to the floor, and I flat busted out laughing. Shishmaref is not on a rocky island at all. It’s on a barrier island! These guys have a village on a barrier island, and they’re surprised that the geography is changing? Barrier islands are notorious for that. They should go talk to the folks from New Jersey or the Carolinas about the joys of building on barrier islands. For millions of years, large storms have regularly changed the world’s barrier islands by cutting new passes right straight through some part of a barrier island chain. Figure 9. Closup of the location of Shishmaref village on Sarichef Island. Not only is the village on a barrier island. It’s on the most vulnerable island, the one with the main inflow-outflow channels on either side. This is a common feature of barrier island chains, that there will be a short island with a channel on each side opposite an inlet, as in this case. The two channels allow storm and tide and melt water to circulate in and out of the inlet. Unfortunately, this also means that these are the highest current locations along the coast, the channels adjacent to the island where tidal and storm and melt waters have to pass through, and thus the most subject to erosion. Anyhow, that was the funny thing I found out that I hadn’t known—that the whole Shishmaref furor is about erosion on a vulnerable barrier island which is routinely battered by fierce storms … I’d be shocked if the island didn’t erode and change and alter its shape. The real climate refugee’s are all of us who are moving south. Check the movement between states in the US. North is minus, South is positive. These figures will not include those of us in Canada who are moving to Mexico or moving to the Bahamas or those who leave Canada to live in the southern US for 4 to 6 months but it will get close to the real figure. Not sure what is happening in Europe. It may be a bargin in Greece now. People in the UK are looking to move to southern Europe. So then who moved the trashcan, and why ? Maldives seem to be still above the water! This has been a know problem since the 1950s, at least. Then again, what about the Europeans who once hunted in what is now the English Channel, the Australian Aborigines who lived and hunted in what is now Bass Strait, etc etc etc. They must surely have been refugees when they had to move as the sea swallowed up their homelands. I reckon an awful lot of us are descended from much earlier climate change refugees; even if we don’t know it. Wind turbines, alternative energy subsidies, carbon taxes; there should be a hot key for this sentence so it can be plugged into just about every article on “climate activism” on this blog. Thank you Willis for your insightful explanation of the cause celeb erosion problems in Alaska. I would also like some data on sea level rise on the Alaskan coast. You probably know where to find it and have the skill to explain it to me. I would appreciate that a great deal. I think we were the first climate refugees when we migrated from England to Australia. It was just too cold. Come to think of it, perhaps it was all those English pensioners who in the 1970s and 80s built houses on the costa del sol or ibitha – same reason – Britain is too cold and it costs far to much to keep your house from turning into an ice block in winter. Much better to move to the south of Spain where its a bit too warm for a couple of months than live in a place that is b***dy freezing for six months of the year. Obama promising more than he can deliver! On Sunday, Obama promised $7 billion in financial support over the next five years to bring “electricity access” to 20 million new households in Ethiopia, Ghana, Kenya, Liberia, Nigeria and Tanzania, as well as help countries like Mozambique develop their oil and gas resources. Barrier island? Yow. Run away, run away! When I saw that map, my jaw dropped to the floor, and I flat busted out laughing. Shishmaref is not on a rocky island at all. It’s on a barrier island! These guys have a village on a barrier island, and they’re surprised that the geography is changing? Barrier islands are notorious for that. They should go talk to the folks from New Jersey or the Carolinas about the joys of building on barrier islands. How about that. As soon as I saw that map even before I read your comment, the very first thing I thought of was New Jersey! In fact if you rotate Figure-8 clockwise 180° it becomes a perfect carbon copy of this … http://goo.gl/maps/q80X8 … see for yourself! And I predict they would have the exact same luck against Tropical Storm / Hurricane Sandy that Seaside Heights did. Well, they’ll probably fare a little better because they probably don’t have a big steel roller-coaster sitting on an old wooden pier jutting out into the water. The story of Shishmaref Village on the way to the main theme reminds me of what In think I know about the history of Seal Beach, California. Seems like when I was young one of the entertainments available was a trip to watch houses fall in, because the breakwater for San Pedro Harbor deflected the currents into the beach. “Some of the contributed factors why we really need resettlement are; over population, poor soil fertility and scarcity of land mass. “We believe it is high time to move into resettlement,” Mr Keungi said. Anywhere you see a sea cliff, the ocean is eroding the land. And the erosion can be rapid where the land is soft unconsolidated sediments, as is the case above. Add in, melting the permafrost that binds the sediments, I’m surprised the island is still there. At some point in the last 30 years, ignorance about pretty anything outside popular culture has become a fashion statement. And the forces behind AGWism are ruthlessly exploiting that ignorance. BTW, nicely researched article, Willis. Naturally the press and encroachment victims blame climate change for the problem, but in fact all the islands are slowing sinking because they are parked on a very viscous layer just below the earth’s crust, and into that they are destined to go. Then there is the natural year over year sea level rise caused by heating of the oceans following the recent LIA, and the exhaustion of aquifers that we don’t bother to refill. Oddly enough we have no trouble refilling with water the toxic mine shafts and the open sores left behind from mining operations like the Bubbly Berkeley Pit in Montana. Orange County in California is a rare exception to the aquifer exhaustion rule in that they budget water to refill the aquifer sitting under the former citrus groves. Well done Willis, but your work is still not done. That’s 2 of the 180 villages about to disgorge climate refugees. Gad, this is hard to keep up with. Well, here’s the full story and the Guardian is sticking to it. Are the 6th (or even 7th) /1st Climate Refugees any relation to the 17th/21st Lancers (Motto ‘Death or Glory’)? What uniforms should they wear? Perhaps we could have a design competition? It was not due to cold. They stole a loaf of bread. Even before considering erosion, the pictures are so different it would be like comparing apples to oranges. There is no detail about the camera/lens setting, also the point at which the pictures were taken are completely different. it’s no comparison at all, but not a surprise really. Unfortunately, there are no tidal gauges in the Yukon Delta. Many of the Alaskan gauges are pointed “down” by a huge magnitude, but it could be an active geology issue (SLR Juneau -12.92mm/year???). Also, there is an Iso-static Rebound treatment of the data these days. According to the “improved data”, San Diego has suffered ~8 inches of sea-level rise since 1913. Tides must be brutal up there at that latitude. It’s like our Bay Area sloughs on steroids. Talk about erosion. Greenland Vikings were the First Climate Refugees. I remember reading about that here on WUWT. The UN had maps predicting from whence the climate refugees would be refugeeing. Turns out that those areas actually gained in population. There were not only no climate refugees, there was a negative number of them. Are the 6th (or even 7th) /1st Climate Refugees any relation to the 17th/21st Lancers (Motto ‘Death or Glory’)? Maybe the 11th Hussars, who were in the Charge of the Light Brigade along with the 17th Lancers, would be a better choice, They were known as the ‘Cherry Pickers’ because of their cherry red pants (trousers). This would seem to be a better name for AGWists. The same in the UK, the migration is south. Those lucky enough to be able to retire abroad relocate to a warmer climate, not a cooler one. Warmth is good, cold is bad. It is difficult to understand why the warmists are so concerned by the prospect of a few degrees of warming. For the majority, this would be a god send. Human civilisation has always flourished in warm periods, and cold periods have always resulted in set backs. As an animal, we would welcome a warmer world. Maybe it’s just me but this whole thing sounds, well, like bureaucratic numbers crunching nonsense. An amazingly accurate to the tenths of a millimeter reading for something so massive as the ‘sea?’ But this accuracy is tempered by it being an ‘estimate’ of an ‘approximation’ of a ‘range’ of that accuracy and further increases are ‘projected’ from ‘models.’ For chrissake, gimme my money back. Oh, and before I forget, may I ask if these “approximately 1.7-1.8 (mm/yr)” increases over the “past century (IPCC, 2007)” conflict with those “projected increased trends” in “the 20th Century?” The 20th Century? Mmm. My boo boo. It’s the NOAA Tides and Currents website. Sorry. Top answer is, http://www.climaterefugees.com – the website of an indy documentary on the subject. That website is a veritable treasure trove of inanity. The number one way for you to Take action against climate change? Drive Smart. I am definitely going to watch the movie. Should be hilarious. What I wouldn’t give to see the Shishmaref Cannonball in all his resplendent glory, mushing his team carrying his solid ivory sled across the snow. Herbie Nayokpuk, the Shishmaref Cannonball..and my all-time favorite Iditaroder. Much better to move to the south of Spain where its a bit too warm for a couple of months than live in a place that is b***dy freezing for six months of the year. When was the last time you visited England? We are freezing the whole year round now! The average maximum temperature this year is still below the 136 year average. just last month, as part of his Geography lesson. Maybe we’re a bit behind the times here in the south west of (not so) sunny old England. I’m also a climate refugee–It was getting so crazy in the Main Stream Media that I had to migrate to WUWT, whichout which I would have been driven totally crazy by climate pronouncements like this (thanks for the expose`, Willis) and dozens of others. I felt like somebody was constantly poking me with a bent stick without justification every time I turned around. Thank goodness there’s an island of sanity and logic in a sea of CO2-ensconsed madness. As usual, it comes down to how long to take to decide what ‘Normal’ is. We humans tend to have a very short attention span, and a corresponding very short term view of what is ‘Normal’. As a geologist I can say you have the above ”problem” covered. For John Coleman, some sea level rises can be laid at the door of land sinking due to isostatic equilibrium changes. This can be due to increases in ice sheet thickness. In Alaska this could be part of the local problem. Deltas sink due to consolidation and de-watering. You have to appreciate the trick photography in Figure 1. Different perspective, different distance to the shore–the result is an exaggerated picture of the shore erosion. 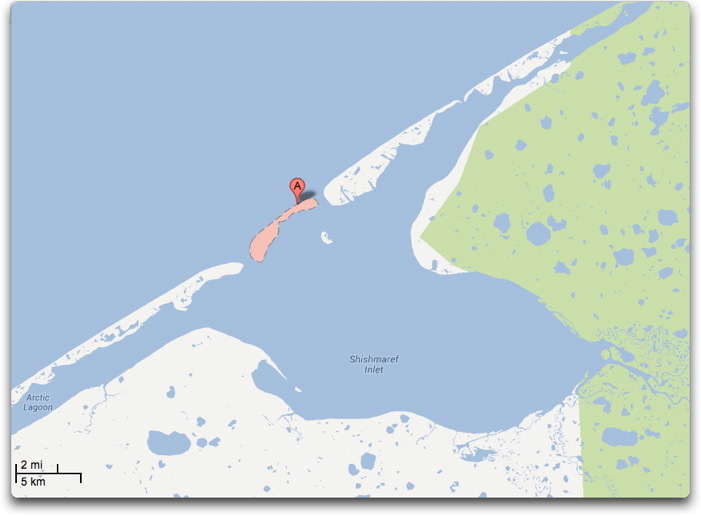 So Newtok is a town a few feet above the water, built on silt, on a small drainage channel that feeds into a larger drainage channel that connects a delta lake to the ocean. What the alarmists choose to ignore is that it is not a coincidence that delta lands are a few feet above water, it is a function of how they were formed. The river carries silt until it slows to the point where it has to drop it. Once the silt has built up to a point where even at high tides, the water cannot over top it, it becomes vegetated dry(ish) land. So long as there is a supply of silt flowing down the river, if sea-level does rise you just return to a point in the process where more silt is laid down until you have dry land again. My inlaws have a place on the sound side (bay) of the Outer Banks of North Carolina. They placed two markers at the edge of the water. In 25 years it eroded 16 inches. The neighbors put a huge retaining wall along their entire shore. Now the retaining wall is 10 feet off their current shore line. It’s a great place to fish because it’s a nice deep channel between the wall and the shore, otherwise the entire bay is only 2-3 feet deep for miles. Every year the Outer Banks change. Shorelines change, inlets fill in, new inlets form. You can trace it back to maps of the 18th century. While the general shape has been here for thousands of years, the details are constantly changing. Yet every change is an “unexpected” surprise and attributed to CO2. What’s wrong with people? Nice work Willis – those climate refugees haven’t left in “finger prints” yet. It also shows what unbelievable knee-jerk ignorance there is among folks that have been decorated with the climate scientist badge – NOAA specialists of course know this simple stuff, but even they won’t directly criticise any of the popular hysteria. Incidentally, for those whose ancestors went on the gold rush at the end of the 19th Century, those who didn’t get any gold in gold country were the ones who didn’t know or failed to learn the meandering stream dynamics you describe. Extending your description to a stream-long time lapse, the meanders also move down the stream like a slow motion action of snapping a wave down a long rope. One final bit of the mechanics that was discovered by University of Manitoba engineering research in the 1950s on one of the historic meandering rivers – the Red River of the North (sorry no link to this research) is that the river water also “corkscrews” downstream at right angles to its cross-section. the surface waters ride over from the inside to the outside of a meander and return at depth. This adds greatly to the scouring action of the water and transport of the sediments from side to side. The Wiki blurb references a 2002 JGR paper which may (or may not!) references the Manitoba research. Follow the river from Grand Forks ND to Winnipeg MB. Climate refugees are currently flooding out of the UK, where we are witnessing a catastrophically normal summer. Some days the sun shines, some days it’s cloudy – some days we have to suffer the rain falling. It’s getting so bad here that the MET office have been unable to issue flood warnings OR instigate hosepipe bans. Reassuringly, most of these climate refugees are able to face coming back after 2-3 weeks, depending on the number of vacation days they have left. The UN IPCC confidently forecast that there would be 50 million climate refugees by 2010 … we saw none. Not only did we see none, most those locations predicted to have fleeing populations actually had growing populations. Some of the cities are the fastest growing cities on the planet! Not content with this fail they then proceeded to predict yet another 50 million climate refugees by 2020! This is how these agencies keep the funds rolling in. Without panic and the spreading of ‘eco-worrier’ batshit the cash flow would simply shrink. This is a con job, don’t fall for it. It’s even worse than it seems. In 2008 it was found that Bangladesh had been gaining land mass in the last three decades at 20 square kilometres per year. Head for the hills you ghost refugees. This reminds me of our local tv station which used to provide local climate alarmism reports daily for the evening news. I remember they went to the shore and recorded videos of coastal erosion and they talked to the local fishermen about sea level rise. Many of them were afraid that AGW was going to destroy their livelihoods. However only 40 miles away, the coast is actually rising and sea level is actually falling there. For some unknown reason, they never reported from this location and they never interviewed the locals there. Funny about that. Willis, a small correction, if I may. You mention ‘relic’ channels resulting from meander cutoff and the like. Please indulge THIS old relic and change the term to ‘relict’, which is the actual term for things geological that remain after the process that formed them has moved elsewhere, like a meander belt. I may have missed the mention in my haste, but deltas as large as the Yukon are also very subsidence-prone due to isostatic adjustments to the sediment pile that accumulates there. Another Greenpeace CO2-ism, of course. Nothing to do with carbon dioxide. Newtok’s citizens were forced to settle there in 1959. They were traditionally semi-nomadic folk so the alleged problem is man-made, but has absolutely nothing to do with co2 inspired thermageddon. By the way the people of Newtok rely mostly on fuel oil for their heating. See what looks like 2 fuel tanks in the image above. Now think about the possibility of soot on ice and snow. I say it was the photographer, for a more “scary” effect. I, myself have been considering life as a climate refugee from the US. I will be fleeing the political climate. I don’t know who the world’s first climate refugees were but they sure aren’t from the last 50 years. The DUST BOWL of the 1930s USA produced climate refugees. We have a lot of people that are willing to risk a lot of money by building vacation houses on the dunes of barrier islands. I’m not sure that I like the idea of lessening their risk by paying for replacing those dunes they are altering. If you are going to build on a barrier island, do it behind the second dune. Nature will have a better chance of protecting your property from storms that are going to come. This has nothing to do with rising CO2 levels. It is economic good sense. As someone with a degree in geography I greatly enjoyed your article, especially the maps. I too burst into laughter at your final reveal about the barrier island Shishmaref is built on. I have a map on my wall of Hatteras Island in North Carolina. It notes the many places where channels have been cut and filled in over recorded history in the area. I wonder if their little barrier island might become two barrier islands in the right storm! The trend since 1993 is about 2.9 mm/year. According to NOAA Technical Report NOS CO-OPS 53, the uncertainty in the trend for a 20 year record length is +/- 2.9 mm/yr. But when, enquiring minds want to know, will the first phony farcical refugees sally forth from the Firth of Forth, near Fife? When I was a kid, dad would leave me in the lab with the erosion table. I could adjust flow and declination to form little oxbow lakes. Loved it. Portage La Prairie is a town in Manitoba whose central park is located within an oxbow formation. Pretty cool, actually. What about the tyre tracks that go over the edge? Look closer. Since the location from which someone took the first shot is now in midair fifteen feet above the open ocean, I fail to see how they could have avoided a “different perspective, different distance to the shore”. But you seem to have the plan, so I tell you what. You go bring us a picture taken from the same spot as the first picture so we can compare them. The tide gauge at Prudhoe Bay Alaska is showing 0.28 mms/yr of sea level rise since 2002. The GPS monitoring stations at Prudhoe Bay and Barrow Alaska are not showing any vertical motion since 2002. Soory, Prudhoe Bay tide gauge is since 1994. Sorry double screwup. Prudhoe Bay tide gauge is showing 3.4 mms/yr since 1994. The Kuskokwim Delta Basin is the general area surrounding the Kuskokwim River as it flows toward and into Kuskokwim Bay, which is its southwestern border. The area is bordered by the Izaviknek River to the north, by the Kilbuck Mountains to the east, by Cape Newerham to the south, and by Etolin Strait to the west. The northeast area of the Basin is considered to be in a discontinuous permafrost zone and the permafrost masses are small, thin and generally isolated. The area is located on a flat former floodplain of the Kuskokwim River and the topographic relief is less than 20 feet. Generally, the soils consist of sandy silt overlying sand and fine gravels. … I may have missed the mention in my haste, but deltas as large as the Yukon are also very subsidence-prone due to isostatic adjustments to the sediment pile that accumulates there. Another Greenpeace CO2-ism, of course. Good catch, Mike. I mentioned subsidence due to the compaction of the soil itself. But I suspect you are right that there would also be isostatic subsidence due to just the weight of the sediment pile. This is the number of Ameridan unemployed, isn’t it? They are mostly caused by this insanity. I assume the delta at the mouth of the Amazon River that formed during the last Ice Age is now submerged under 200 feet of sea level rise ? Is anyone taking cores of it ? Excellent choice! I think they should have quite elaborate headgear too, black feathers like the Bersaglieri perhaps (although without the marksmanship of course)? ‘When can their glory fade? The perspective and distance are indeed different by I am not sure “trick” is fair. Using the pole with an angling brace and the white window and door casings on the mansion behind it the pointing direction and alignment are not that far off (and I not sure the “off” is in direction favorable to an intent to deceive. The tire tracks look honest and make it clear there WAS road there not long ago. And I think the different focal length is hostile to the illusion-intent speculated as to the shape and depth of the eroded portion. I say it was the driver of the first vehicle to drive past after the earlier tire tracks had disappeared. My 2c. England has been losing villages to the sea for a thousand years. Venice was built on such ground as Newtok is (for defense reasons) – and yes, it’s been sinking ever since. Who took the Shishmaref “before” picture, and when, and why? Were they prescient,or did they have a plan? It’s easy to “erode” dirt with a fence pole and sledge hammer. “I assume the delta at the mouth of the Amazon River that formed during the last Ice Age is now submerged under 200 feet of sea level rise ? Deltas need comparatively calm waters with weak longshore currents in order to accumulate. The Amazon empties into the energetic Atlantic and the sediments are carried away and distributed by wave action and currents away from the mouth of the river. If conditions were conducive to delta accumulation, the delta, like that of the Mississippi, Ganges, etc. would keep pace with sea level rise. This is why it is essentially fraudulent to spread alarm about the disappearance of the delta lands with global warming. If sea level rises, the sea water temporarily intrudes up the river channel, but this means that the river borne sediments then hit this calm water then drop their sediments early, building up the land encroached upon. Indeed the Mississippi and Ganges at the end of the ice age were issuing into a sea 120 metres lower than at present and as the waters rose, the deltas kept pace. The problems with deltas caused by storms and floods including shifting channels, washing away of sand bars, erosion of farms, etc. exist with or without global warming. In the late 70s early 80s I worked as a surveyor on the North Slope of Alaska. We frequently used geodetic survey markers established in the 40s and 50s. Many of these markers were placed on bluffs above the Arctic Ocean. The recovery notes for the bluff-side markers invariably remarked that the stations were in danger of being lost to erosion or had already been lost. Before being relocated by the government, the natives had fish camps, whaling camps and winter camps, none of which involved permanent structures. Whatever modern erosional issues exist have absolutely nothing to do with climate change and everything to do with political interference with native customs. Guardian had a weep story on Newtok not long ago. From a first look at Google Earth, it was clear the climate refuge story was not so simple. I did a little bit of research. The villagers have trouble ahead. The existing plans to relocate them to safer ground seems to be the right one. The villagers were settled here (some say forcibly) by the government in 1959. Richard Wisecarver who claims to have relatives in the village says his father-in-law was forced there in 1946. 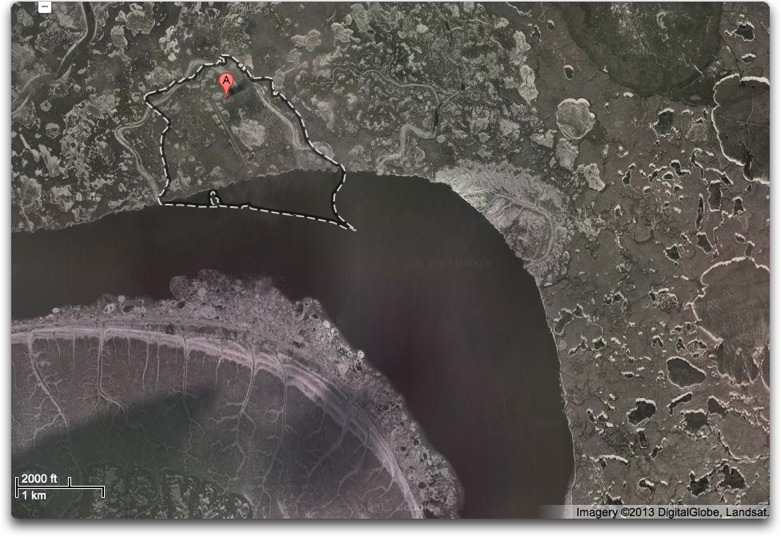 A look at Newtok on Google Earth shows this was an unwise place to settle, being on the downstream side and outer edge of a wide meandering river on an area of very low lying flat land. Natural erosion by the meandering river is 100% inevitable. Richard Wisecarver says: “The site [from 1946 onwards] was very bad with a poor quality water, no drainage and flooding during storm driven tides in the spring & fall, Bob Kilongak, my father-in-law was always concerned about the flooding and the erosion by the Niqliq river since the tide ran in and out of the Baird Inlet twice a day in a raging torrent.” This is further evidence this was a bad place to settle people. ‘Thermal degradation’ implies this could be due to climate warming. However, we learn of the phenomenon of ‘thermokast slumping’ whereby human settlement in a sensitive permafrost area can cause permafrost melting. When you think of roads, motorized vehicles, airstrip, heated buildings, etc, this seems perfectly logical. So what is causing the melting? The weather gauge data, just 200km east of Newtok, and 100km east of the main area of up-river ice shows no overall trend from 1940 to present. Bethel temperature record. Thus, we can conclude that regional warming is not a likely cause of melting. Much more likely is the impact of human settlement combined with the natural process of meandering river erosion. Regarding the caption against the child on the concrete block which says: “A child plays in a flooded area of Newtok village”. This appears to be nothing to do with river flooding or erosion. It is most likely a typical puddle of permafrost melt, which any satellite or aerial image of the area shows are ubiquitous – but perhaps more common in the village due to the heat from human settlement. Okay. So what about us who where born and lived in a little fishing village called Saint Martins,NB,Canada on the Bay of Fundy? Our sea level changed 23 feet every 12 hours,and has for at least 356 years? I seriously doubt my great-great-great-grandad who built wooden ships there contributed a whole lot of CO2. But in 1850, my great-grandfather could walk 30 mins to reach the shore at peak tide.In 1998,I had to walk 25 minutes to reach the same spot. Yet 600 yards from our house,in the opposite direction,is the harbour. I will willing pay for anybody to come check it out(R&B free). So how is it so stable.And we are on the shallow end.20 minutes east ,they average 47 feet.Yet very little erosion.Oh.And there is a manmade break water at the harbour that has been there for over 200 years,yet no adverse effects.Just real curious why it seems so different what others are describing here. If you look very carefully at the trashcan and telephone poles and buildings, you will see that the second picture was taken from further away and at a different angle. The trash can is in the same place, and there is still a road to the left of it. At first glance at the two pix, there seems to be some considerable erosion, but after the different vantage point is taken into consideration, you simply cannot tell. Maybe there is no erosion at all. Of course, there is no (detectable within limits of error) global warming at all, either. Oh, please. Maybe you “simply cannot tell”, but some of us can. In addition, there’s a whole scientific study on the erosion and its causes. They’ve been fighting it for years. They are planning to move the village. Your claims, that somehow there’s no erosion at all, are laughable. And Nelson Island where they ONLY stayed during the summer. In the winter Nelson Island was too exposed. In the summer Newtok land would melt. When permanent houses were built for them, the builders obviously had no idea of WHY they were moving. Now they are sick of being stuck on moist land during the summer. Which will be too exposed in the winter. So once moved, they will become climate refugees again. Asking to move back, maybe? Such are the vagaries of nomad life, when forced to settle down. adrian_oc, thanks for a clear and succinct account of these poor folks. Their fate is not unlike those of other nomadic groups that have been forced or induced to settle permanently … there’s usually a reason they were nomads. Good point, Willis. Nomads typically live in areas where there is not a reliable supply of food and water. How this gets warped by modern notions of political correctness is classically illustrated by the Mabo case, which established the concept of land rights for Aborigines in Australia. The Mabo case was based on a claim by the people of Mer, an island off north Queensland inhabited by Polynesians. They had settled villages, clear ancestral land boundaries for families, gardens which supplied most of their food and even a structure like a court to settle land disputes. No sensible court would argue that they did not “own” their land, and indeed, the High Court did not. But, in a breathtaking leap of judicial activism, they then asserted that nomadic Aborigines on the mainland “owned” whatever territory they roamed (or claimed to roam) as well, with some exceptions. The fallout from that absurd decision will probably take generations to sort out. But, it has bought new Beemers every year for many lawyers and their spouses, plus holidays in France. All paid for by taxpayers, of course. Western civilisation fell in love with the Romantics, caught the nasty diseases, and is still wistfully hoping that things might work out – like a bad C&W song.